Whether you're a medical professional, researcher, student, or a generalist or specialist focusing on pain or arthritis, this is your one-stop reference for understanding and treating joint pain in osteoarthritis. David T. Felson, Clinical Epidemiology Unit, Boston University School of Medicine, Boston, Massachusetts, USA. Hans-Georg Schaible, Institute of Physiology, University Hospital of Jena, Jena, Germany. PART I: THE NEUROSCIENCE OF ARTICULAR PAIN. 1. Spinal Mechanisms Contributing to Joint Pain (Hans-Georg Schaible). 2. Activation of Sensory Neurons in the Arthritic Joint (Blair D. Grubb). 3. Changes in the Neural Substrate of Nociception in a Rat Derangement Model of Osteoarthritis (James L. Henry). 4. Inflammatory Mediators and Nociception in Osteoarthritis (Bruce L. Kidd, Jason J. McDougall, and Julia J. Inglis). 5. Phantoms in Rheumatology (Candida S. McCabe, Richard C. Haigh, Nicholas G. Shenker, Jenny Lewis, and David R. Blake). 6. Mechanisms That Generate and Maintain Bone Cancer Pain (Juan Miguel Jimenez-Andrade, Monica Herrera, and Patrick W. Mantyh). 7. Symmetry, T-Cells, and Neurogenic Arthritis (Nicholas G. Shenker, David R. Blake, Candida S. McCabe, Richard C. Haigh, and Paul I. Mapp). PART II: OSTEOARTHRITIS AND PAIN. 8. Joint Mechanics in Osteoarthritis (Walter Herzog, Douglas Bourne, and Aliaa Rehan Youssef). 9. Neuromuscular Aspects of Osteoarthritis (Kenneth D. Brandt). 10. Pressure-Driven Intravasation of Osseous Fat in the Pathogenesis of Osteoarthritic Pain (Peer A. Simkin). 11. Structural Correlates of Osteoarthritis Pain: Lessons From Magnetic Resonance Imaging (Philip G. Conaghan). 12. Evidence of Sensitization to pain in Human Osteoarthritis (Gunnar Ordeberg). 13. Current Perspectives on the Clinical Presentation of Joint Pain in Human Osteoarthritis (Paul Creamer). PART III: TREATMENT OF OSTEOARTHRITIC PAIN. 14. General Approach to treating Osteoarthritic Pain: Targeting Biomechanics Inflammation and Nociception (David T. Felson). 15. Neurobiological Mechanisms of Osteoarthritic Pain and Analgesic treatment (Tuhina Neogi and Joachim Scholz). 16. Exercise, Taping, and Bracing as Treatments for Knee Osteoarthritis Pain (Kim Louise Bennell, Michael Anthony Hunt, and Rana Shane Hinman). 17. 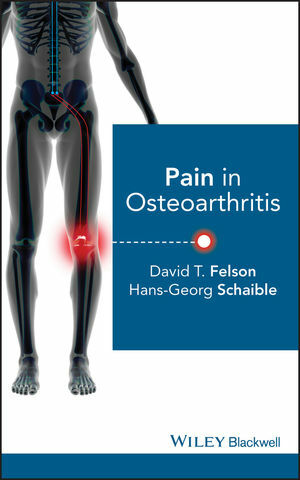 Treating Inflammation to Relieve Osteoarthritic Pain (David T. Felson).